MILFORD, Indiana, U.S.A. – To aid producers in their biosecurity measures, Brock has developed a ladder lock-out system to help restrict unauthorized access to the ladder on feed or grain storage silos. The company’s economical Ladder Security Door attaches securely to the feed or grain silos exterior ladder to discourage its use. The optional ladder door bolts to the side of the silo ladder and hinges over several rungs. It can then be locked in place to keep small children and unauthorized individuals from climbing the ladder. The unit easily installs on the ladders of all new as well as most existing BROCK® and CHORE-TIME® Feed Storage Silos and BROCK® Grain Storage Silos. Brock's Ladder Security Door also can be used on ladders with ladder cages. 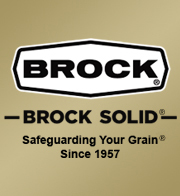 Brock’s Ladder Security Door is another part of the company's next generation of innovative feed and grain storage systems and accessories.